Typically, I'm pretty good about sticking with my weekly menu plan. Sure, things may get pushed back to the following week, or we may skip a planned dinner here or there for leftovers or take-out, but as a general rule, I make what I plan. So there I was, doing my weekly grocery shopping, and I happened to see crab legs on sale for a ridiculous price. I immediately threw some in my cart, and there went my planned dinner for that night. I honestly had no idea what I wanted to do with them: steam and dip into melted butter, make some sort of taco or pizza? salad? risotto? pasta? Eventually, I decided to stay pretty classic, and make crab cakes. But of course, not just any crab cakes. Summery crab cakes. Filled with fresh sweet corn. And topped with mango salsa. Oooh and avocado cream! It was a great decision, and it resulted in a pretty killer dinner. As is my M.O. these days, I prepped this dinner while the boys napped. I picked the crab, mixed and formed the crab cakes, threw together the salsa, and then just pan-fried the cakes and made the avocado cream when it was dinner time. I actually think chilling the crab cakes helps them stay together better - I've yet to make a crab cake that didn't require using the utmost care when flipping them. Seafood goes really well with mangos, and avocados (Exhibit A. Exhibit B.). And while these may seem like they have a lot/too much going on, the crab really does shine. The slight sweetness of the corn plays really well off the crab, and the little kernels provided a great textural contrast in the crab cake. I also really loved how the kernels on the outside of the crab cake got nice and crispy in the pan. 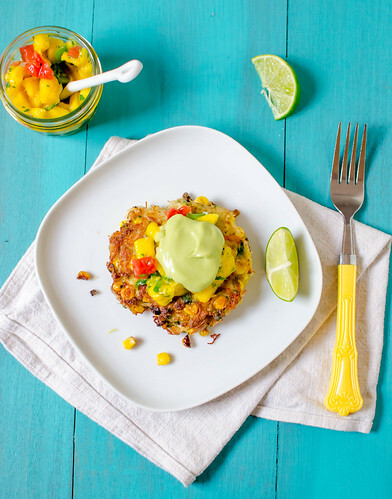 The sweet and spicy mango salsa is a great complement to the crab cake, and the avocado cream gives the whole thing a creamy, rich finish. makes 4 crab cakes, with enough salsa and cream leftover for chips and dip. Combine all the ingredients in a medium bowl, and gently mix with a spatula. With wet hands, divide the mixture into 4 parts, then form into patties that are about 2-3 inches across. Arrange in a single layer on a parchment-lined baking sheet, cover with plastic wrap, and refrigerate for at least 1 hour. When you're ready to cook the crab cakes, heat the oil in a large nonstick skillet over medium-high heat. Very carefully transfer the cakes to the skillet, and cook 3-4 minutes per side, flipping very carefully with a metal spatula. Serve immediately. To prepare the mango salsa, combine all the ingredients in a medium bowl. Taste and season with more salt, lime, or hot sauce if necessary. For the avocado crema, use a fork to mash the avocado in a medium bowl. Add the yogurt, sour cream, hot sauce, and lime, and continue mashing to form a smooth sauce. Add more yogurt or sour cream to achieve your desired consistency, and season with salt and hot sauce. I have never made crab cakes at home, but I love ordering them at a restaurant. I think this is just the recipe for me to try! Yum! Thanks for sharing! Well I'm glad you made an exception and strayed from your menu plans for these babies! They look wonderful! Crab cakes are one of the things I miss most about not living on the east coast anymore. Since the mangos look so good in the store right now this might be the perfect time to try this!